Toddler Approved! 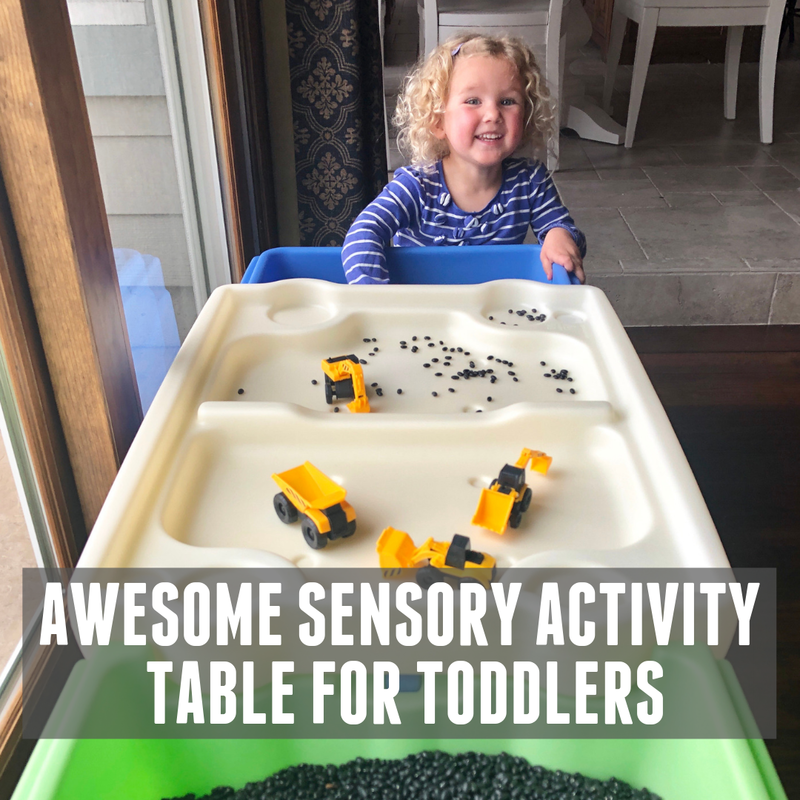 : Awesome Toddler Sensory Activity Table! Do you do sensory play activities at your house? Do you have any favorite materials or tools that you use? What are your favorite types of activities to set up? 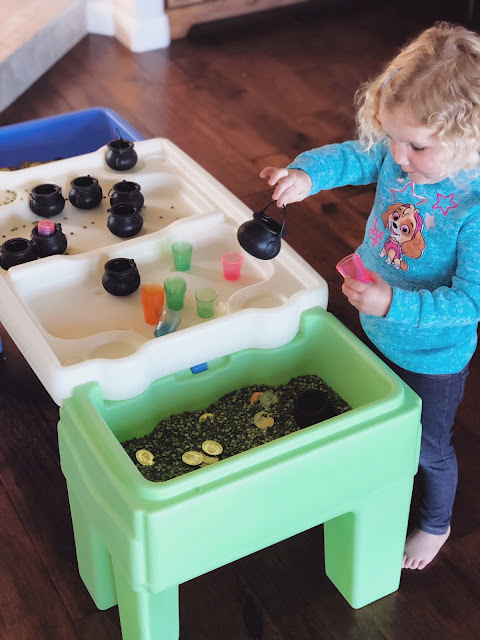 For the past several years for sensory play time we have always used large plastic containers on the floor that we have filled and emptied and stored... repeat! I have loved our simple system because the containers can easily hide under beds. Often though, kids have wanted to stand while playing so they could move around easily and so we've been torn between putting the sensory tubs on the table and on the floor... and it was never a perfect system because we were constantly changing things. 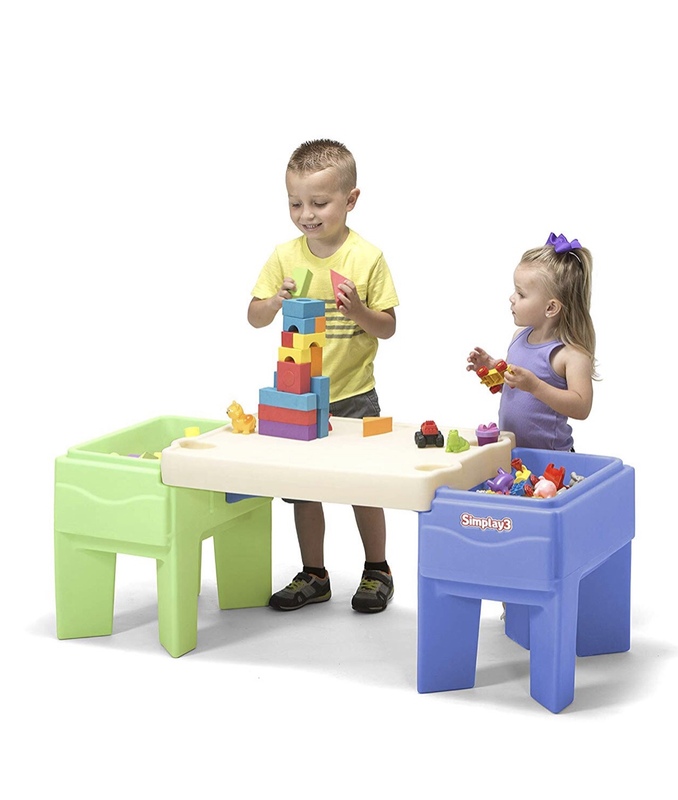 Introducing our new favorite Activity Table! 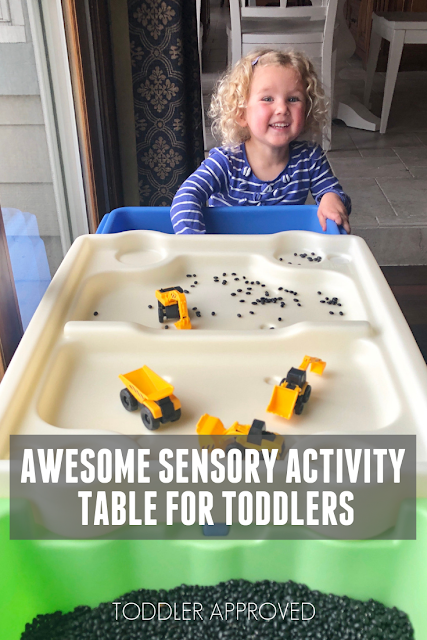 Recently we were gifted an In and Out Activity Table by Simplay3 and we have really been enjoying several different simple sensory activities using this new table! I wasn't completely sure if I would like the table at first because I typically prefer more neutral colored tables and furniture. I was also worried that the table would be too big. Once it arrived though, my opinions changed! It can be used 4 different ways! Here's a quick view of the four different set up options. The bins can be out and accessible or covered and used as storage. The table tops can change as well! My kids love the recessed table option for sensory play and the flat table option for writing and drawing. I love that I can cover up the bins for when we need a little break from sensory play (especially more messy bins) or want to hide some toys or tools. 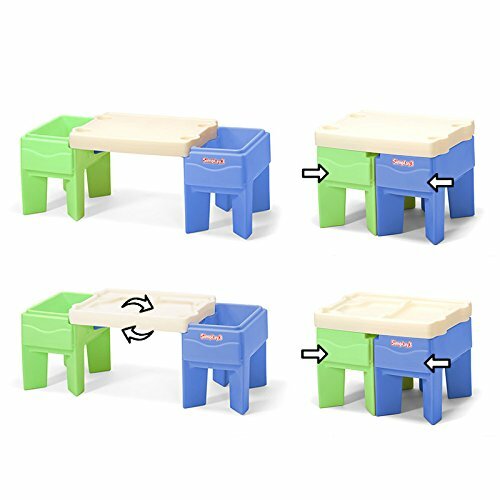 Here are 6 Simple Activity Table Set Ups we've tried with our new table! So many of you have asked to see the different ways that we are using our activity table, so I am going to share five different ways that we've used the table so far! We will be sharing additional ideas over on our @KristinaToddlerApproved Instagram account over the next while. 1. Sticks & Cereal Playdough Towers! We used the flat activity table top to make towers with our little friends! To make these towers, you just stick skewers into a ball of playdough and then let the kids thread the cereal through the skewers. This is always a hit and is great for fine motor skill building! This is probably the easiest sensory bin. We love our Cat 6 mini construction trucks. All you need are trucks and dried black beans! So simple! My 6 and 8 year old love to join in for sensory bins too. They aren't just for toddlers! Water play is always fun. I do this inside and outside! When we do it inside I just keep towels nearby for any accidental spills. I plan on them... and since it is water I don't make a big deal about spills. If kids start dumping too much water onto the floor than we just clean up everything and put the bin away. For our recent water play time we just got out our sand toys to play with in the water. Several people asked, "Why bugs?" The answer is... because my toddler loves bugs and it was Wacky Wednesday! Finding bugs in your pasta is pretty wacky, so it totally worked! Shovels and scoops also made this bin extra fun. We used this with our little toddler class and everyone had a blast! Playdough always kicks things up a notch. I love the flat table side of the activity table for this activity. Kids could play with playdough and build with it and then grab noodles from the side sensory bins to stick into the playdough. It was so fun and allowed for a lot of creativity! Scroll up to check out this easy bin. We also used some mini black pots since we did this one around St. Patrick's Day. The dried split peas are probably the messiest sensory bin filler we've tried lately. They go all over the place when kids dump them out of the bin. They are not as messy as rice, but a close second! Fortunately our favorite sensory bin clean up helper, our amazing cordless stick vacuum, is super strong and makes it easy to clean anything up! Now that we've shared some of our recent favorite sensory play set ups with you, tell me what you love! What is the "go to" or "most popular" sensory play set up you've done lately? If you liked this post, you way want to check out some of our other 18 Favorite Sensory Play Activities for Toddlers.